Welcome to Open Heaven Church. Open Heaven currently has three expressions which meet across Loughborough in the East Midlands. Location: Room 1, Loughborough Student's Union (LE11 3TU) during term, Rosebery Community Centre (LE11 5EQ) outside of term. Our OH1 gathering for 18-30’s meets in the afternoon. Every week we worship, immerse ourselves in scripture and push into God's presence together; propelled into a lifestyle of discipleship and mission. Ticketed parking and bike racks are available. Location: St. Peter's Centre (LE11 5EQ). OH2 is our family-friendly expression of Open Heaven. Our aim is for children to grow and flourish and for adults to be equipped and strengthened to establish heaven on earth. 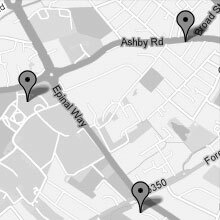 Location: Various across Loughborough. OH3 is our most recently formed gathering which meets in homes and is shaped around communities which celebrate feasting and worship across nationalities. Gatherings currently happen once a month. Contact office@openheaven.org to find out more.